Open daily, June to October, 10am to 5:00pm. Find the perfect gifts and souvenirs for everyone on your list, and while you’re at it, don’t forget to pick up that special something just for you! From the young to the young at heart, we have a unique and meaningful assortment of gifts that truly reflect the Algonquin Park experience. 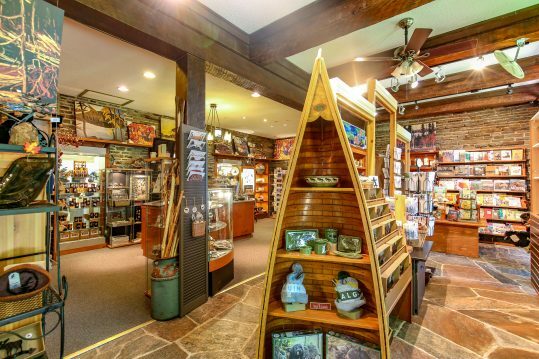 Choose pottery canoe, a platter, a handmade piece of jewellery, a stuffed animal, a framed print or book about the Group of Seven, cards that capture the image of a perfect Algonquin sunset or sunrise; all selections are made with our visitors in mind. As the gallery celebrates the variety of wilderness and wildlife art, the Boutique celebrates the exceptional diversity of Canada’s talented craftspeople and fine artists. Come and enjoy their handcrafted and unique works in the Boutique. Whether it’s your first visit, or your first this season, we continue to bring back your favourite items, as well as add new products to our distinct assortment. Although we like to promote artists from the Algonquin and Muskoka regions, we also carry finely crafted works of many emerging and established artisans from across Canada. Handmade silver, ceramic and beaded jewelry, candles, cards and books, delectable treats, fashion art, glass, metal, wooden and ceramic artwork – there is no shortage of inspiration or selection. We are proud to offer you items that are not only designed and crafted here in Canada, but are created with an awareness for the environment and a focus on sustaining our earth. Notebooks and journals made from recycled paper, wooden creations are carved from discarded branches and driftwood, 100% handpicked organic tea, the list is growing and we are working to improve this selection each and every season. The perfect complement to our wilderness and wildlife gallery, the Boutique allows you to indulge your senses by delving into the warm feeling of a handmade scarf comforting you on a cool summer’s eve, or flattering the perfect dinner outfit. Taste the sweetness of Muskoka maple syrup over your campfire pancakes, or enjoy locally made jam to complement your brunch at the cottage. Smell the wonderful and varied scents in our candle selection, and listen to children’s laughter as they hear the chirps of our toy birds. Watch how summer sunlight enhances the colours of hand blown glass art and sun catchers, or look at inspirational reproductions, prints and books. We offer an informative and entertaining variety of art books, art supplies, stationary and cards which include story and colouring books for children, arts, crafts and nature ideas, methods and techniques to enhance your art ability in a number of mediums and skill levels, sketch books and supplies, art and artist history books including the Group of Seven and Tom Thomson, collections of inspirational photography, calendars, notebooks, art and photography cards; there is something to suit every taste and budget.